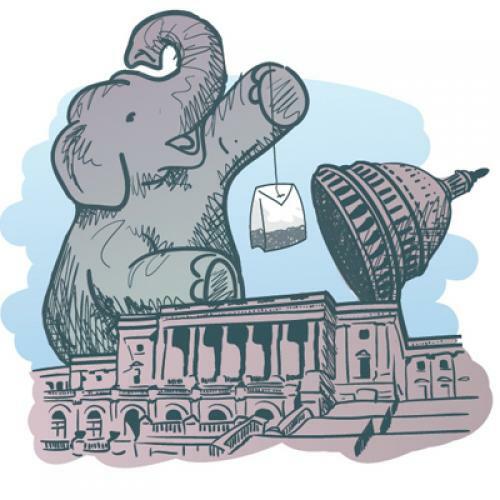 How a formerly fringe caucus is giving Tea Parties a direct line to the Hill. The closest thing Congress has to its own Tea Party takes place every Wednesday afternoon, in the Gold Room of the Rayburn House Office building. At 1:15, more than 100 congressmen and one aide each gather for the meeting of the Republican Study Committee, and for a little over an hour, the legislators chat about their latest projects to reduce the size of government--or, at least, to stop the latest Democrat effort to expand it. The RSC, once a huddle on the party’s far right, now claims nearly two thirds of the conference as members, and has been launching some of the most strident and effective attacks against Nancy Pelosi’s agenda. Joe Pitts, of the bipartisan Stupak-Pitts amendment barring federal money from funding abortion in health care legislation, heads the RSC’s values action team. A former RSC chairman, Jeb Hensarling, was at the forefront of the GOP’s unanimous opposition to financial regulatory reform. Marsha Blackburn, another active RSC member, became the party’s point person to slam action on climate change in Copenhagen. Meanwhile, after years bedeviling House GOP leadership from the right, a former chairman has crashed the leadership’s inner circle--and RSC members are the ones generating a suite of ideas that could form the basis of Republican governance should the party take the House back in 2010. But this RSC has more than just hot air behind it. The new conservative energy bubbling up in tea party protests and primary challenges around the country isn’t particularly friendly to Republicans; a recent poll had Republicans even trailing the Tea Party as a political brand. To those grassroots activists, RSC members--not Michael Steele, in his hamhanded bid for tea party cred--are the good guys. That rapport was on display one evening in early December, when three of the RSC’s leading lights--Blackburn, Joe Wilson, and current chairman Tom Price--headlined the Washington, D.C. premiere of Tea Party: The Documentary Film. Price, a slim Georgia orthopedist with a pious mien, features prominently in the movie, and was greeted with cheers. After his speech, the filmmakers and characters assembled onstage, and Price presented each of them with a framed copy of the congressional resolution he had introduced--though, of course, it never passed--praising their patriotism. It was a symbolic gesture of appreciation, but also of fealty: Tom Price’s RSC, in its ascendance, is making the tea partiers the new center of the American right. The RSC isn’t supposed to be the idea generator of the House Republican conference. That duty falls to the Republican Policy Committee, an official organ of leadership--but its influence is hard to discern. The Policy Committee atrophied for a decade under the future failed SEC chairman Chris Cox. A subsequent chairman, Adam Putnam, was a young rising star, but he clashed with the party’s conservative wing over the bank bailouts--now, he’s running for commissioner of agriculture in his home state of Florida. The current chairman, Thaddeus McCotter , presides over an infrequently-updated website and hasn’t put forth a coherent agenda. The RSC, by contrast, offers a constant stream of press releases and comprehensive legislative bulletins. On a half-million dollar annual budget financed by member dues, its ten staffers determine whether each bill, among other criteria, expands the size and scope of the federal government. Tom Kahn, a senior Democratic staffer with the House Budget Committee, says the RSC’s influence is much more evident from where he’s sitting, perhaps because they’re able to focus on a clear and simple message. By the 1980s, the RSC had grown into an ideological proving ground, as members agitated on issues ranging from Fed reform to school prayer. Tom DeLay began his climb through the ranks by becoming chair of the RSC in 1991. In 1993, the caucus had 130 members, and a serious place in the Republican hierarchy. Undeterred, the former leaders of the RSC quickly reorganized as the “Conservative Action Team,” a smaller but purer klatch of agitators who pushed to abolish the National Endowment for the Arts and defund the Department of Education. The RSC of the late 1990s might have been more of an annoyance for House leadership than ever before. Now, the RSC has one of its own among the party brass: Pence has risen to chairman of the Republican conference, consistently staking out territory to the right of his fellow leaders. In the NY-23 special election, for example, he refused to endorse moderate Republican Dede Scozzafava, to the displeasure of leaders like Boehner and whip Eric Cantor. David Keene, the longtime chairman of the American Conservative Union, explains how that alters the GOP dynamic. “[Pence] has strength in the fact that he knows one of the reasons he’s in leadership is that he has these troops on the outside,” he says. Over the last decade of rapid growth for the RSC, the one constant has been a jovial political science PhD and longtime GOP operative named Paul Teller. As the group’s executive director, he’s the guy running the conservative movement’s idea factory. But when I asked Teller who, politically or philosophically, he looks to for inspiration, it took him a second. Anyone more recent? I asked. This was harder. “You can see how much stuff I’m reading, it’s not too much,” he said, uneasily, before offering the name of a scholar at the American Enterprise Institute. That at least plays well with the base, which knows him well. Every Wednesday, Teller attends Grover Norquist’s longstanding breakfast meeting at the downtown DC offices of Americans for Tax Reform. And the RSC never strays far from its natal twin, the Heritage Foundation. “It’s hard to think of where we would disagree,” says Michael Franc, the think tank’s vice president of government relations. At the moment, the RSC and its allies are discussing a reprise of the document that helped bring Republicans out of the wilderness in 1994: Gingrich’s Contract with America. Like the original, Norquist told me, this one would most likely be composed of a slate of legislative proposals, this time developed by the RSC rather than House leadership. In addition, Norquist ticked off a list of items the new contract might also include: No czars. Fiscal transparency. A waiting period to read bills. A top corporate tax rate of 25 percent. But, he cautioned, the RSC will only be the conduit. As we talked, Teller started speculating on what the RSC might tackle first, if the GOP returns to power. If Republicans take back the House in November, Teller and company might just get the rollbacks they want. The Republican caucus has lurched right in recent years, with the retirement or defeat of moderates like Virginia’s Tom Davis and the last New England Republican, Chris Shays. Other middle-of-the-road leaders, like Mark Kirk and Mike Castle, are taking their chances in the Senate. The moderates who remain often join the RSC to inoculate themselves against charges of insufficient devotion to the cause; several members also belong to less conservative caucuses like the Tuesday Group and the Main Street Partnership. Meanwhile, tea partiers are backing their own candidates in 2010--people the Heritage Foundation’s Michael Franc calls “citizen legislators”: engineers and police officers and marines, all looking for a fight. The RSC will be there to welcome them.